Un-Headed Crown-Nut Installation 1) Fabricate a punch appropriate for the type of Crown-Nut and the depth of installation required. 2) Ensure that the receiving tube is firmly secured. 3) Place the Crown-Nut inside the punch, making sure that the crowns are orientated correctly, (bent towards the punch, as shown). 4) Place the Crown-Nut and punch assembly on the head of the tube, ensuring that the crowns are orientated correctly (square to the tube walls). It is important that the end of the tube is a uniform shape and cut perpendicular to the side of the tube, as any cutting errors will be detrimental to the fit and function of the Crown-Nut . 5) Gradually apply pressure until the end of the run and the punch bottoms out. 6) Remove the punch. Non-binding dimensions in mm. It is advisable to carry out preliminary assembly tests to determine the size that gives optimal performance in your application. Ideal for applications subject to pull forces. Not suitable for push loads. Not having a head allows fitting of the Crown-nut insert inside the tube section at your own defined depth. Press fit: gradually increase pressure on the insert until the required depth is reached. It is highly recommended that a sleeved punch is used to ensure the insert is installed squarely and at the correct depth (see below). An Insert for use inside the end of square section The Crown-nut is a revolutionary solution for the creation of a strong reusable female thread at the end of round or square section tubes. Crown-nut solves the issue of how to securely fix to the end of square section, guaranteeing superior torque-out and pull-out performance. The product range offers solutions for round tube and square section and is available in a wide range of sizes. A version is also available that is designed to accept push-fit castors. Advantages of the Crown-nut • Can be installed into square section with a wide internal size tolerance range. Thanks to the flexibility of the crown design, the same item code can be used for a range internal sizes. • The crown is designed so that the shape of the tube section is not altered during installation, guaranteeing the aesthetics of the external surface. 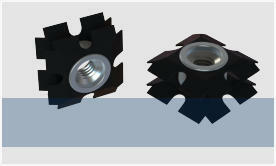 • Crown-nuts are easy to install and are cost effective. The press-in fit is fast and easy, enabling the elimination of traditional and costly assembly processes such as welding and staking. Note After the insertion of the Crown Nut avoid heat treatments, galvanization and other heating operations that could compromise the characteristics of the product.